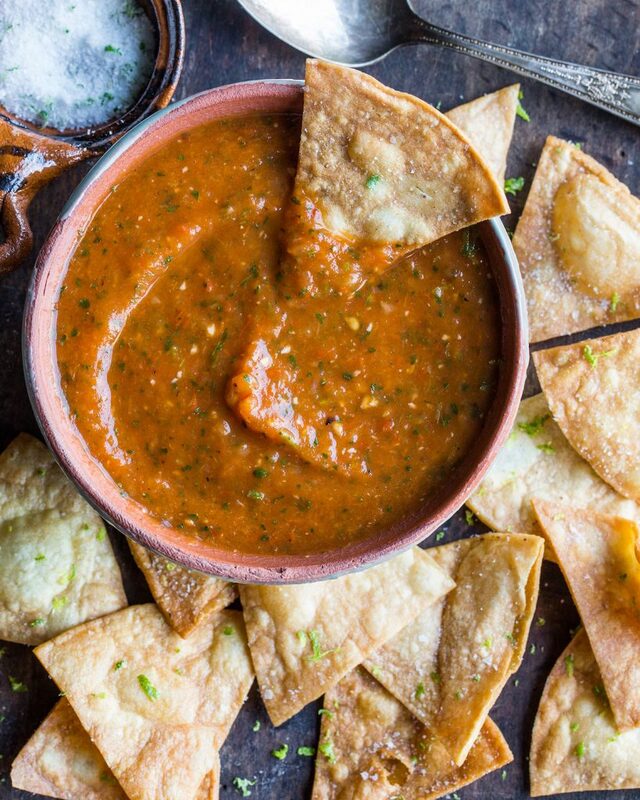 I’m pretty sure as humankind we have agreed that everyone likes chips and salsa. Right?!? Well, I am elevating your typical jarred salsa with bagged chips by making it all from scratch. When you roast the fresh vegetables in your oven, blend the ingredients together, and freshly fry the chips, it’s a whole different story! Adding in the chipotles in adobo give the salsa a nice spice and a hint of smokiness! Place the tomatoes, onion, garlic, and jalapeno on a greased baking sheet in the oven to broil for 5-10 minutes, until charred. Remove from the oven and place the broiled vegetables in the food processor along with the remaining in ingredients. Pulse until everything is evenly blended. Taste and adjust with salt, pepper, and chipotle to your liking. Pour into a serving dish and cool before serving. Preheat the vegetable oil in a large pot to 350 degrees Fahrenheit. In a small bowl mix together the kosher salt and lime zest. Cut the corn tortillas into 6 even chip-shaped pieces. Once the oil is at temperature, place the tortillas, in small batches, into the oil and fry for 2-3 minutes, until golden brown. Transfer to a baking sheet lined with peppers towels. Immediately after removing the chips from the oven sprinkle with the lime salt.